The painting was created to honor Marco Marazzoli, a court artist of the Barberini family and renowned harp virtuoso. 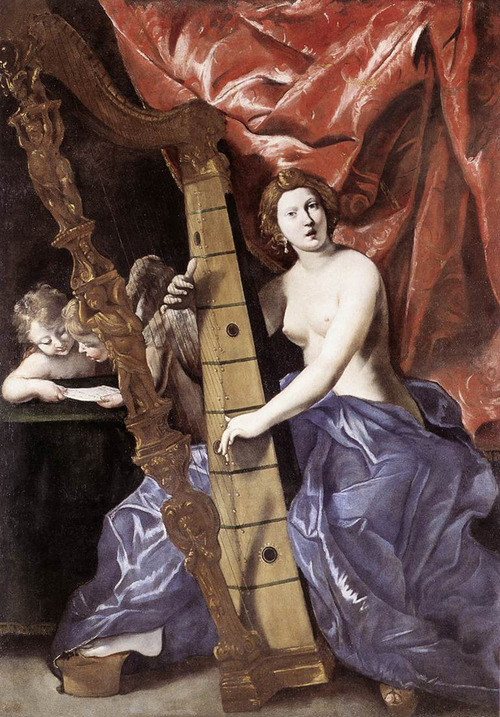 Lanfranco celebrates the artistry of his friend Marazzoli by placing the imposing Barberini harp in the foreground, played by a young woman dressed as Venus, who seems to sing along. The setting of the background is intentionally dramatic: the large red drape contrasts with the shimmering blue of the maiden’s dress and the pure white of her naked body, while two little cupids read the music. A particularly fascinating example of Baroque painting, engaging and delicate at the same time, so as to amaze and captivate the viewer. The famous Barberini harp, a rare and fine instrument dating from the early seventeenth-century, is faithfully reproduced in the painting. It is enriched by precious gilded carvings and by the Barberini coat of arms with its bees. Today the Barberini harp is on display next to the painting by Lanfranco so that the visitor can compare the two at a glance in order to admire the perfection of the reproduction and imagine the great value of this instrument.